Barbecue season is in full swing over here, and luckily our friends love patio dinners just as much as we do. When we’re hosting, the drinks are always the easy part: ice cold beer and a good wine for sipping. But because barbecue is almost always associated with meat, the meal itself can feel like more of a challenge. What can vegetarians make when cooking for a not-so-vegetarian crowd? These Chipotle Black Bean Burgers of course. If you’ve been over to your place for a BBQ dinner, there’s a good chance you’ve had these burgers. They’re easy to make, can be prepped in advance, and make for flavor-packed patties that can satisfy a crowd. 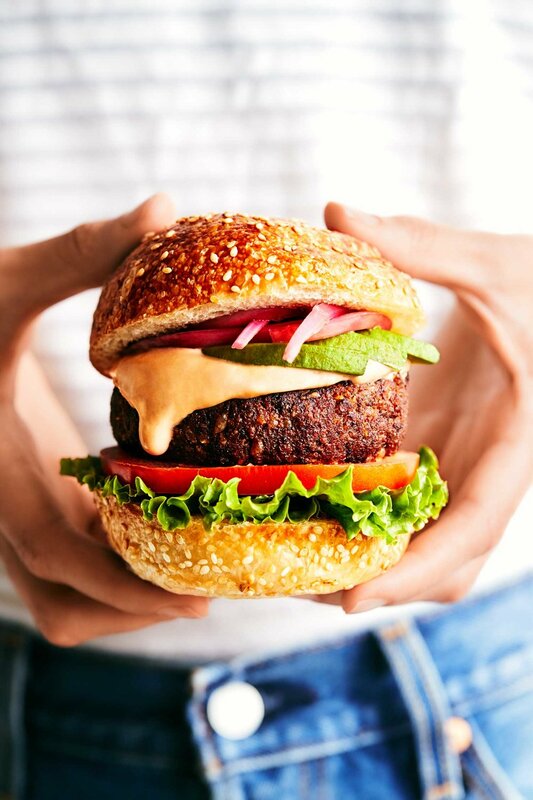 They hold up well on the grill which is often half the battle with homemade plant-based patties, and their sturdiness means that can handle a mile high stack of toppings (like chipotle mayo *drool*). And here’s for the best part: all our meat-eating friends love them! Seriously. If you’ve made our Smoky Mushroom Tacos before, then you’ll probably love these burgers too. 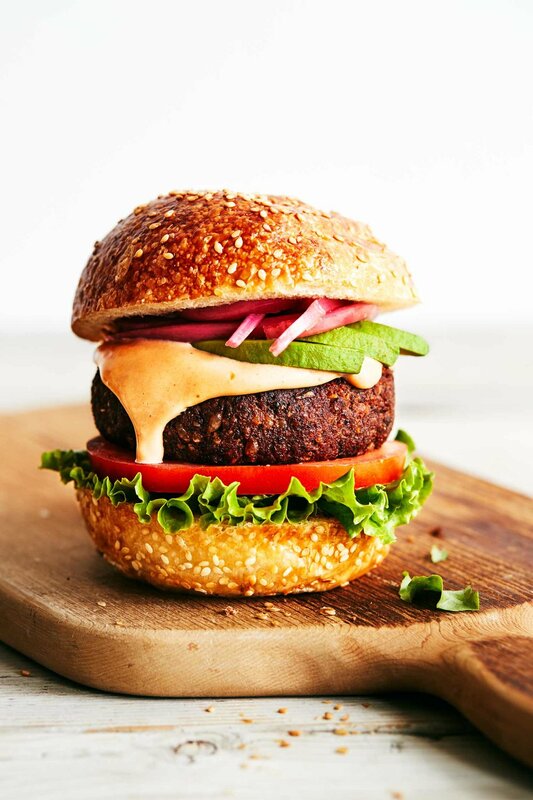 This Chipotle Black Bean Burger recipe relies on a similar mix of spices to pack in the flavor without needing a ton of ingredients. The trick? A can of chipotle peppers in adobo sauce. You can find these in almost every grocery store, so keep your eyes peeled near the other Mexican ingredients. There’s both peppers and sauce inside each can, and you’ll need both for this recipe. 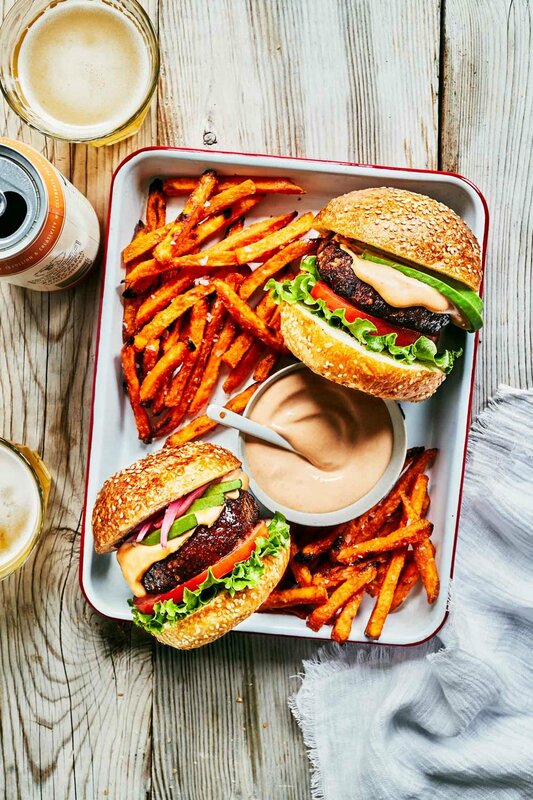 In total you need a dozen ingredients both for the burgers and the chipotle mayo. Making them is drop dead easy - there’s only a few steps required. First you need to brown the onions and mushrooms. Then, you’ll dump these into the food processor along with the rest of your ingredients. Whiz together, then stir in the breadcrumbs and form into patties. We like these best when grilled on the barbecue, but in case a grill isn’t accessible to you, you can also sear them on the stove (and bake them in the oven). We’ve included instructions for both. These patties are super flexible - and while intended to be piled high in a burger, you can most definitely eat them on their own! We like to chop up extras and serve them in salads, or eat them alongside grains and veggies in a bowl. They also make for a quick high-protein add-in for busy weekday lunches. While the chipotle mayo is of course optional, it takes only two ingredients and we promise you it’s totally worth it. The chipotle mayo is delicious when slathered on top of the burgers. It adds a creaminess that makes you totally forget this dish is entirely vegan. Sweet potato fries are a great thing to serve on the side (because who doesn’t like sweet potato fries?!). And they just so happen to go perfectly with extra chipotle mayo. Coincidence? We think not. Heat skillet on medium-high heat. Once hot, add 1 tablespoon neutral oil. Add diced onion and saute for 5 minutes. Add in chopped mushrooms and cook for an additional 5 minutes, or until onions have browned and mushrooms have released their moisture. Transfer onions and mushrooms to a food processor. Add pumpkin seeds, tomato paste, chipotle peppers, 1-2 adobo sauce, cumin and salt. Pulse until nearly smooth (there should be no full pumpkin seeds left), scraping down the sides 2-3 times to incorporate. Add strained black beans and pulse until they’re mostly pureed (some bits are fine, for texture). Add cooked rice and pulse until evenly distributed. Transfer mixture to a large bowl. Use a spatula or spoon to fold breadcrumbs into mixture. Divide the mixture into 6 tightly formed balls (approximately 3/4 cup each). Use your hands to flatten and shape into burger patties (no more than 1-inch thick). Brush patties with remaining 1 tablespoon of oil on both sides, then cook on a searing hot grill until browned on the outside and firm to the touch (approximately 10 minutes). See below for alternate cooking instructions. While the burgers cook, whisk together vegan mayo and 3 teaspoons of adobo sauce. Taste and adjust if needed (e.g. add 1 teaspoon of adobo sauce for more spice). Slather on top of burgers, and add other toppings. -*We like spicier burgers, so we use 2 tablespoons of adobo sauce in the burger patties. If you prefer less heat, opt for 1 tablespoon of sauce instead. -**Short grain rice is “stickier” than longer grain varieties, which helps with binding. To get 1 1/2 cups cooked short grain brown rice, start with 3/4 cup uncooked rice. Measure after cooking as you'll have a little bit of extra rice. Rice can be made in advance and refrigerated before using. You can also use the rice immediately after cooking. -Alternate cooking instructions (stove top/oven): Using a well-seasoned cast iron pan (or non-stick), heat over medium-high heat. Add patties (brushed with oil) on searing hot pan and cook for approximately 4-5 minutes for each side (covered with a lid). Patties can be eaten as is, but for firmer burgers, cook in a 300°F preheated oven for an additional 20 minutes.